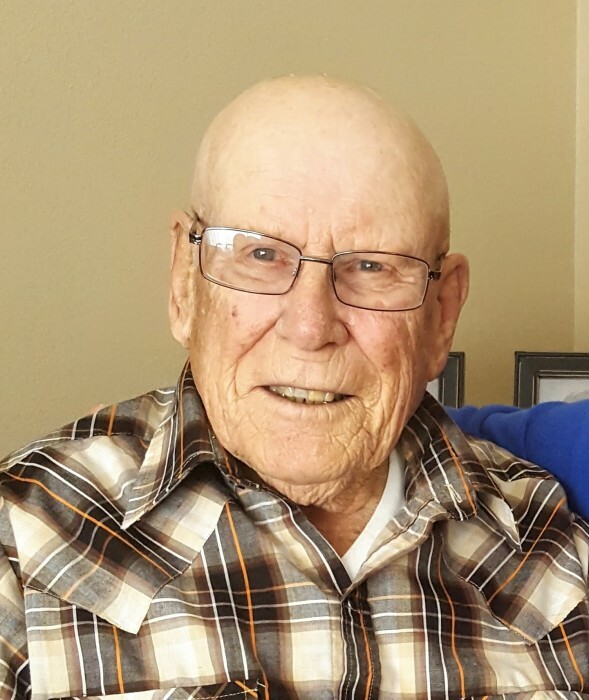 Burton ‘Burt’ Hoff, age 88, of rural Foley passed away Thursday, June 28, 2018 at the St. Cloud Hospital. Funeral services celebrating the life of Burt will be at 12:00 PM, Friday, July 6, 2018 at Glendorado Lutheran Church. Visitation will begin after 10 AM Friday morning at the church. Rev. Shari Routh and Rev. Timothy Wittwer will officiate. Burial with full military honors by Foley American Legion will be in the church cemetery. Burton Howard Hoff was born May 6, 1930 to Henry and Macie (Wager) Hoff in Benton County. He attended country school at the one room school district #48. After school, he worked at Rap-In-Wax Paper Company in Minneapolis. He was drafted into the United States Army on January 9, 1952 at the age of 22. After serving in the Korean War, he returned home and started farming on the family farm. He married Gladys Orton on August 20, 1955. Together they enjoyed music, especially country western and polka. They loved to dance the night away. They were blessed with two children, Sharon and LeRoy. Burt was a longtime member of Glendorado Lutheran Church, the Glendorado VFW and Foley American Legion. Burt was a true farmer and still loved to have a large garden. He enjoyed attending Auctions and purchased many John Deere items and milk cans. He had a passion for antique cars, tractors and all that went along with them. He will be remembered by his genuine interest and care of others, along with his witty (yep, yep, yep) generous spirit. A welcoming cup of coffee awaited everyone that would stop over. In lieu of flowers, memorials are preferred. Burton is survived by his children Sharon (David) and LeRoy; grandchildren, Brandon, Ryan (Ashley) and Kyle; great-grandchildren, Mikayla, William, Mason, and Owen; brother, Don (Jan) and his faithful companion, his dog, Remmi. He was preceded in death by his parents; loving wife, Gladys (2-27-18); brother, Leo and sister-in-law, Bev. The family appreciates all the hugs, gifts, food, thoughts and prayers. No Thank You cards will be sent.